Firefighters tear apart what is left of the barn to reach hot spots. Botkins firefighters help put out a barn fire. 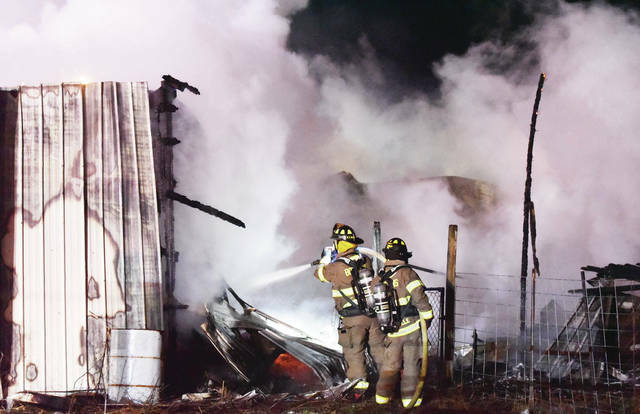 Animals are believed to have perished in the fire at the Jeff and Kim Rickert residence, 12320 County Road 25A, just south of Anna early Sunday morning. Fire departments responding were from Anna, Botkins, Fort Loramie, Jackson Center, Maplewood, Port Jefferson, Minster Fire - Jaws of Life and Van Buren Township. The Shelby County Sheriff’s Office, Anna Rescue and Anna Police also responded. ANNA — An early morning fire Sunday destroyed a barn, which was home to a family’s sheep. A ram, three ewes who had just given birth to lambs, five lambs and four pregnant ewes, all having twins, were lost in the fire. Rickert said her daughter, Keighlynn, saw an orange reflection on the wall of the house. She looked out of the house and saw the flames coming from the barn. The fire was discovered just after midnight. Keighlynn and her grandfather, Jeff, had been in the barn earlier in the evening after one of the ewes had given birth. “The terror you hear in a phone call from your child as they watch something they love and work so hard for just burn to the ground, it’s indescribable,” said Rickert in a Facebook post Sunday afternoon. Both Keighlynn and her brother, Carson, show lambs during the Shelby County Fair. They had registered their projects in January, said Rickert. Rickert said the family, which includes her husband, Shane, are in shock over the fire and the loss of their animals. They are still processing the ramifications of the fire and how they will proceed with the fair. In addition to the sheep, Kim and Jeff Rickert lost all of their farm equipment that was stored in the barn along with other belongings. Rickert, who is a member of the Anna Rescue Squad, said the family is blessed to have another family within the rescue squad. “They started calling me as soon as they heard about the fire,” said Rickert. “They’ve been bringing things to the house for us. They all know how much we love our lambs. Rickert said the community, churches, neighbors and other “people we don’t know” have called or stopped by the house to see how they can help. “This has been a very humbling experience,” said Rickert. Fire departments who battled the fire included Anna, Botkins, Fort Loramie, Jackson Center, Maplewood, Port Jefferson, Van Buren Township and Minster. Anna Rescue, Anna Police and Shelby County deputies also assisted at the scene. No cause for the fire has been determined. 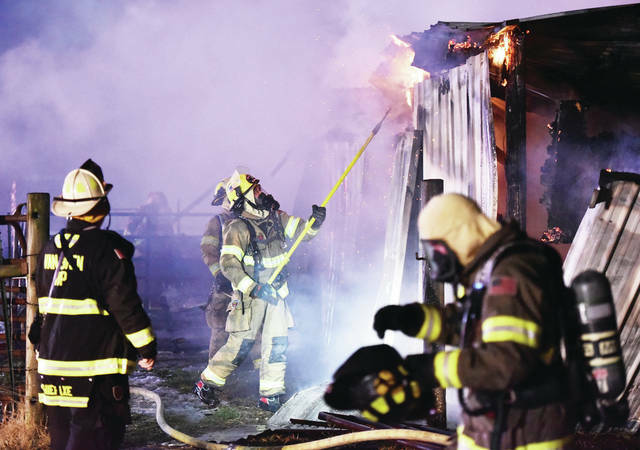 Botkins firefighters help put out a barn fire. Animals are believed to have perished in the fire at the Jeff and Kim Rickert residence, 12320 County Road 25A, just south of Anna early Sunday morning. Fire departments responding were from Anna, Botkins, Fort Loramie, Jackson Center, Maplewood, Port Jefferson, Minster Fire – Jaws of Life and Van Buren Township. The Shelby County Sheriff’s Office, Anna Rescue and Anna Police also responded. Reach the writer at 937-538-4822.